I qualified as a chartered architect over twenty years ago at the University of Bath and I have been fully employed by established Bristol and Bath architecture practices where I have gained a breadth of experience of the design of a range of building types procured under different contract routes. At the same time, throughout my professional life I have been approached by friends and domestic clients who have asked me to carry out architectural services. This has now amounted to over 300 small scale projects and due to the increasing demand I have now set up my own practice in Portishead where I can concentrate on personally producing hand crafted plans for each individual client. Before starting your building project it is wise to seek the advice of a trained and qualified architect. I can help you decide precisely what you want by developing attractive solutions to your building problem. Even the humblest of extensions will benefit from the design skills of an architects input. 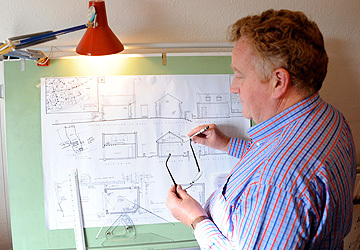 I can design detached garages and garden buildings to one-off houses. I can usually advise on the feasibility of your project at the first site visit and give you an idea of the budget to set aside for the work. I normally try to identify the needs in the form of a brief and then I consider the site constraints of the development. I will also advise you on the latest planning and building regulations which are becoming more and more demanding and stringent and guide you through the building contract arrangements and any health and safety matters. I can produce building material specifications for the builder to price and help with the tender process if necessary. I can inspect the building construction as the works proceeds and administer the contract if you require. I can also help with loft conversions, internal renovations and obtaining grants and I will advise where structural engineering advice may be required. I can incorporate Eco-sustainable design solutions. 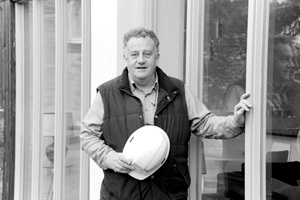 I have experience of work on listed buildings and building design within conservation areas.